It's been just a few months short of four years since the last Black Label Society album was released, which is a fairly long gap, so fans will be pleased that the wait is finally over. Once they hear the album then that long wait will seem completely worth it as Zakk Wylde has produced a superb album here. You're probably thinking the title refers to some satanic church, but if you think that then you'd be completely wrong - the Black Vatican is Zakk Wylde's recording studio at his home in Los Angeles. Rather than me telling you about "My dying time", the first single from the album, it's better if you have a listen to it yourself, so I recommend you watch the video below. With "Angel of Mercy" things are slowed down and Zakk fetches out his acoustic guitar. It's a soft acoustic song with Zakk's vocals really sounding good and carrying a real emotional feel to them. It's a great song, and the electric guitar does come out for a nice guitar solo halfway through the song. "Scars" is another acoustic track. "I've gone away" is a song that has a good heavy guitar riff and is a heavy song, but I could see it working well acoustically too with it's fairly slow pace and great vocals. There's a nice guitar solo here too. With Zakk Wylde you expect great guitar work, and the album certainly doesn't disappoint on that score, but there's far more than just good guitar parts here - the songs are great and the vocals are very good, carrying plenty of emotion particularly in the slower acoustic tracks. A superb album, and going by the strength of it, if Black Sabbath ever feel the desire to replace Ozzy then Zakk Wylde seems the obvious choice to replace him as his vocals certainly have an Ozzy feel to them. In fact listening to the album there's a real Ozzy Osbourne/Black Sabbath feel (which is probably inevitable given how long Zakk Wylde spent as Ozzy's guitarist). It's an excellent album and if you're a fan of Ozzy or Black Sabbath and haven't listened to Black Label Society then you're missing out so its definitely worth a listen. 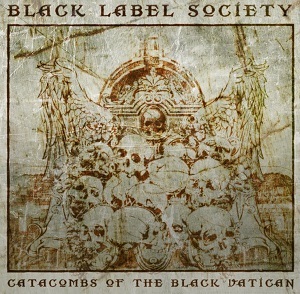 "Catacombs of the black vatican" will be released on 8th April 2014.